Around Christmastime, home cooks find themselves cooking larger cuts of meat, whole animals and the like, because we're generally feeding larger groups of people. No-one likes dry meat, and one of the eternal questions about cooking meat is brining. Harold McGee, everyone's favourite food scientist, says that brining takes away the meat's own juices and flavours (because osmosis), and/but the salt breaks down some of the proteins so the meat will end up more tender (or mushy, if it was already very tender, or it it's been brined too long). McGee recommends rubbing meat with salt and leaving it for a day or two ("dry brining") instead. With this method, however, it appears that dryness in the meat is a given, as is suggested in his article for the New York Times (he talks about serving turkey like pulled pork, with a ladle of sauce over the top). Question is, is compensating with a good sauce good enough? Given the horror stories of dry meats at parties (I've sure eaten my fair share), I'm personally still a fan of brining. Your timing has to be right - over-brining can lead to awfully tasteless results, and I've found that lean, white meat in particular do benefit from brining, and when its dry, meat can be horrible to eat, no matter how flavoursome it might be. With calculated, minimal brining time, I've found that a balance of flavour and moisture can be attained*. I guess like most things in life, brining is a delicate balancing act. Basic brine recipe: 1 litre of water to 4 tablespoons salt. *Although I did learn from Harold that adding aromatics into the brine (herbs, veggies) etc. is pretty useless as those flavour molecules are mostly too big to penetrate the meat (see point 6 here). I've been using salt, water, onions, leeks, bay leaves and black peppercorns for lean pork chops, and Pioneer Woman's turkey brine for poultry. I'll try just using salt next time to test that theory out. After a whirlwind trip to Toronto last week, I came back with a suitcase full of chocolate and alcohol. I'll be writing about Dillon's, a spectacular new boutique distillery near Niagara Falls, soon (but probably not on this blog). First, though, I'm going to start on the low end - Canadian Club. It's that time of year again! 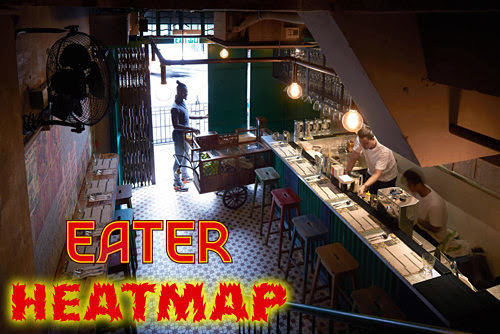 The second 2013 edition of the Eater Hong Kong Heatmap is out. 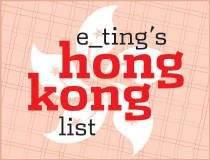 The number of restaurants in HK that have opened in the past few months has been astounding. 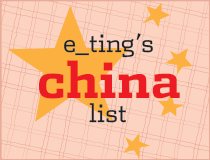 I couldn't include them all in the Eater map. Aside from the ones on the Eater list, others worth noting are: Teppanroom (new teppanyaki room in the Grand Hyatt's Japanese restaurant Kaetsu), Ham & Sherry (Jason Atherton), Prune (new deli by the lovely Grassroots Pantry gals), 85 South (southern BBQ), The Bellbrook (Australian), Sushi Kado, Plat du Jour, La Vache, Zafran, Ginza Iwa, Upper Modern Bistro (ex-chef at St. George at Hullett House), The Boss (Cantonese), Little Burro, The Butcher's Club (butcher, private kitchen, dry-ageing specialists), Locofama, Pez, Opendoor Cafe and La Cantoche.